Donald Trump Cozies Up To Molestation/Adultery/Prostitution Scandal Ridden KKK-Affiliated Anti-LGBT Hate Group [VIDEO] - Joe.My.God. 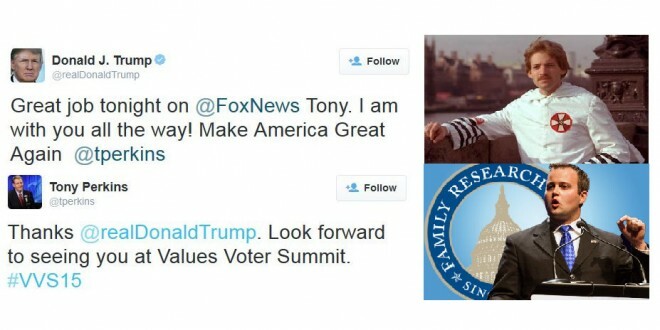 Last night Tony Perkins appeared on Fox News to declare that Jesus can still save Josh Duggar despite all that compulsively shoving his no-no pole into forbidden random lady holes, prompting Donald Trump to tweet his congratulations. In recent days Trump has been trying to win cred with the evangelicals, repeatedly declaring that that bible is his “favorite book” despite apparently being unable to quote a single verse. Judging by Perkins’ response tweet, Trump has confirmed his attendance at this year’s Duggar Fest, although the usual celebratory announcement has not yet appeared on Twitter.